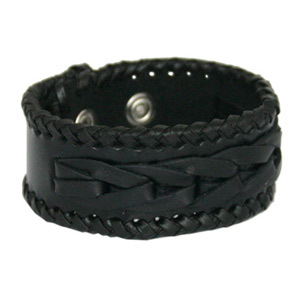 This attractive bracelet for men and women is handmade by the leather jewelry artisans of Thailand. The design features a woven pattern and stitched edges. 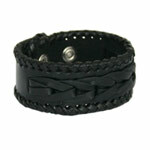 This black bracelet is adjustable for 2 wrist sizes and closes with snap fasteners. Closed (Maximum wrist length): 18.0 cm length x 3.0 cm width. Closed (Minimum wrist length): 15.0 cm length x 3.0 cm width.